To Kill a Mockingbird—the twentieth century’s most widely read American novel—has sold thirty million copies and still sells a million yearly. Yet despite her book’s perennial popularity, its creator, Harper Lee, has become a somewhat mysterious figure. Now, after years of research, Charles J. Shields brings to life the warmhearted, high-spirited, and occasionally hardheaded woman who gave us two of American literature’s most unforgettable characters—Atticus Finch and his daughter, Scout. At the center of Shields’s evocative, lively book is the story of Lee’s struggle to create her famous novel, but her colorful life contains many highlights—her girlhood as a tomboy in overalls in tiny Monroeville, Alabama; the murder trial that made her beloved father’s reputation and inspired her great work; her journey to Kansas as Truman Capote’s ally and research assistant to help report the story of In Cold Blood. Mockingbird—unique, highly entertaining, filled with humor and heart—is a wide-ranging, idiosyncratic portrait of a writer, her dream, and the place and people whom she made immortal. As a life long reader, I am sad to say, I was late to the To Kill a Mockingbird party. I was never required to read it in school. So, I never did. I finally read this book in my late 30’s. What an impact! I am glad I waited to read this. I feel the book had more meaning to me because of my age. After I finished the novel, I immediately rented the movie. Once again, I had to see what all the fuss was about. And the fuss….was very well done! 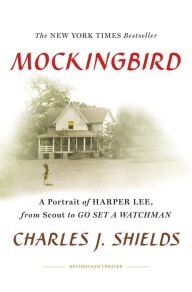 Mockingbird – A Portrait of Harper Lee added so much to my repsect for Harper Lee. This book takes you from the beginning to the end. Her struggles as an unknown writer to one of fame and fortune are all covered. Her life with Truman Capote is covered in depth. He was such a large impact and influence on her as a person, as well as a writer. She as well, was probably his only friend. I am going to have to read more of his works. Even if you are not a fan of Harper Lee, this is a great read. I enjoyed so many aspects. Old Hollywood, how publishing worked and historical murders are all recreated. Harper Lee became more real to me as I read this book. I understand more about her life and her struggles. And what made her such an outstanding character and such a talent. I received this novel from the publisher and Netgalley for a honest review. This entry was posted in Reviews and tagged nonfiction, reviews. Bookmark the permalink.